Montanus Rocca – John's Cameras. This camera was made by a German maker that I have never heard of before. This is not really any cause for concern as they bought in both the lens and the shutter from established suppliers – the lens from Ennna in Munich and the shutter from Gauthier in Calmbach. The maker is Montanus who were based in Solingen, Düsseldorf, West Germany. This camera was made with snob appeal as it looks for all the world like it has a built-in light meter. In the 1950s this was unusual and only found on the more expensive cameras. The light meter on this camera is not actually a light meter. The bobbly light meter window has nothing behind it and the light meter readout and controls on the top plate is actually a Sunny 16 exposure calculator. This camera does, however, have a fully functional coupled rangefinder. The camera is well made from metal. The main casting is aluminium, the top and bottom plates and the shutter fascia are stainless steel and the back is steel.. The body is covered with black leatherette which is in good condition – there is a small amount of lifting around the hinge of the back. The edges of the body and the back, where they are not covered by leatherette, are painted satin finish black. The hinge is chrome plated steel and is rusty. Montanus were basically a plastic company and you might expect their products to be made from plastic but the only plastic that I have found is the take-up spool and the Sunny-16 calculator. Now for the description. The camera is oblong with a slightly curved profile. It measures 124 by 90 by 72 mm. The top plate is satin finish stainless steel (as far as I can tell). On the far right is the mock exposure meter readout. In fact, this is a Sunny 16 calculator. This consists of two rotatable plastic discs. The bottom disc is clear perspex. Beneath it is a series of shutter speeds and four icons representing different scene types. These are yatch and lighthouse to present a beach, mountains and ski lift to represent snow, houses and trees to represent landscape and finally four trees to represent shaded (woodland) landscape. Towards the middle of the bottom disc are printed three numerical series. They are DIN film speed, ASA film speed and apertures. The top disc is made from aluminium. This has two painted pointers to allow you to set your film speed in either DIN or ASA. Behind them are three more icons to represent the weather. They are: cloud with rain, cloud with sun and bright sun. To use this, you set your film speed, line up the weather icon with the scene icon and read off an exposure couplet from where the aperture scale is against the shutter speed scale. In the centre of the the top plate is the accessory shoe. This will have been intended for a flash gun. It is a cold shoe as direct connection of flash guns was still in the future. On the far left of the top plate is the rewind knob.This is generously proportioned – 22 mm diameter – and pulls up to release the film cassette and allow the insertion of a new film cassette. This rewind knob has a film type reminder in its top. This has six options – colour negative and colour positive both for sunlight film, colour negative and colour positive both for artificial light film, positive for monochrome film and negative for monochrome film. This is set by gently depressing the centre and turning it. On the rear of the top plate, on the right, is the film advance lever. this moves through 180 ˚ to advance the film one frame. The lever is made from chrome plated pressed steel. When at rest, the tip stands a few mm proud making it easy for the user’s thumb too get a grip. In the middle of the rear of the top plate is a name plate announcing “Montanus Solingen” in painted script. To the left of this is the viewfinder eyepiece. This is only very slightly raised (by about one mm) and measures 10 by 7 mm. There are bright lines for composing landscapes but no additional bright lines for close-up work. In the centre is a bright disc – this is the rangefinder spot. With more up-market rangefinders, the internal mirrors were made with gold rather than silver, giving an orange rangefinder spot. The orange colour makes the split-image easier to see. This spot is silver but bright enough to be easy to use. The front of the camera is dominated – as always – by the shutter lens assembly. When focusing the lens, you get a double image within this disc. As the lens gets nearer to focus, the two parts of the double image move closer together. When the lens is fully focused, the double image becomes a single image. Rangefinders need calibrating occasionally and this particular rangefinder would seem to be correctly set up. The front of the top plate has a large chrome fascia taking up most of the available space. Inside this fascia are four items. First, on the left while looking at the front of the camera, is what appears to be a light meter window. There is no light meter fitted to this camera but one was available as an optional extra (and cost over £8.00 which was a lot of money in the 1950s). having the light meter window in place without a light meter b behind it would have given an element of undeserved street cred. It would have also made actually fitting a meter both easier and cheaper. Next to the dummy light meter window is a small (5 mm diameter) hole which is the rangefinder window. This is 42 mm from the centre of the viewfinder which is a respectable distance (the longer the distance, the more accurate the rangefinder) and compares favourably with the Leica rangefinder of the time. Next to this is the camera model name is silver script – Rocca. Around the name is a rectangular slit – this slit provides the illumination for the bright lines in the viewfinder. On the right of the fascia is the viewfinder window. This measures 20 by 15 mm and has a distinct orange coating (which is not apparent when looking through the viewfinder). The front of the camera is dominated – as always – by the shutter lens assembly. This is surrounded by a curved rectangular fascia of satin chromed metal. The profile of this fascia is typical of the 1950s. As well as the shutter/lens assembly, this facia carries, on the top left (right, when using the camera), the shutter release button. This is chromed metal and is threaded for a standard cable release. This shutter release button is at right anglers to the camera body. On the opposite top corner is a PC connector for flash. This is the only way of attaching a flash gun as the accessory shoe is a cold shoe – no electrical contacts. The shutter itself is a Prontor SVS from Gauthier. This is the EV version of the SVS shutter. With an EV shutter, the shutter speed and aperture rings are linked together. Turning the shutter speed ring also adjusts the aperture. This is to allow the user to adjust the shutter speed or aperture without worrying about maintaining the set exposure. There are a total of 16 EV settings from 2 to 18. Many light meters of the day offered EV numbers as a part of their read-out. If we assume a nice sunny day and 100 ASA (sorry, ISO) film, the ‘correct’ exposure would be 1/100 seconds at f/16. this is EV 15. Having set this EV value on the shutter, you can rotate the shutter speed to 1/300 and the aperture will set itself to between f/8 and f/11. Or you can set the shutter speed to 1/60 seconds and the aperture will set itself to f/22. The shutter speed can only be set to the marked speeds but the aperture is continuously adjustable between f/2.8 and f/22. Setting the EV value is done by pressing a pressed metal lug on the left of the aperture ring and turning both the aperture ring snd the shutter speed ring until the required EV is against the red index mark on the right side of the shutter housing. Also on the right of the shutter housing is the flash synch setting lever. This can be set to X for electronic flash or to M for flash bulbs. There is also a V position. V stands for Vorlaufwerk which is German for ‘delay mechanism’ and offers a delay of 8 seconds between pressing the shutter release button and the shutter firing – or it should; on my particular camera, this ‘V’ setting is very hesitant but does eventually fire the shutter. The lens is an Ennit from Enna in Munich. Enna are not a big name lens maker but produced a number of innovative lens designs over the years. This Ennit would seem to be a Tessar clone – four elements in three groups. This should be a good lens – my test roll will tell for sure. The apertures for this lens are f/2.8 to f/22 which is a very respectable range for a general purpose camera. There are five aperture blades with straight edges giving a pentagonal aperture. For lovers of bokeh this is not good news but for the rest of us it will be fine. The lens has a focal length of 45 mm (which is ‘normal’ for 35mm photography). The lens focuses from about three feet (the actual minimum distance is not marked on the lens but is closer than the shortest marked distance of 3.5 feet. This closest distance is going to be close to one metre. 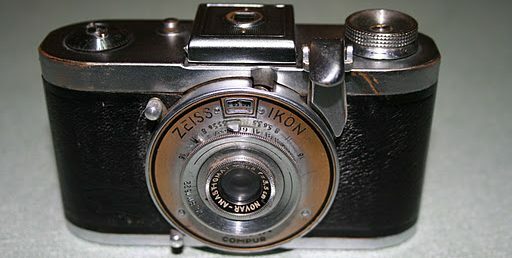 The lens focuses by moving the front element only – usual for cheaper cameras – which is not ideal but I doubt that any user of this camera will have noticed the slight image degradation. I know that the lens is front cell focusing as the rear element is behind the shutter and visible from inside the back of the camera. When focussing, this rear element clearly does not move. The lens is coated – certainly the front surface of the front element and the rear surface of the rear element. I cannot see the internal surfaces but I would think that they are coated as well. The barrel of the lens, as distinct from the shutter housing, is black painted aluminium with a heavy machined grip at the front. As this camera is in working condition, I shall be trying it with film in the near future. Before I do, I am going to dry-fire the shutter a few dozen times to ensure it is free enough to work properly. At the moment, it occasionally does not fire when the shutter release button is pressed. When the film is complete, I shall post the results here. I find that to be a charming camera! The sheer simplicity of the construction is admirable and all the important “bits” (lens, shutter, exposure setting, etc.) seem sound.